Nations Press feature news LOOK: Prince of Thai with tattoo and Wearing sleeveless,Caught The attention of Netizens! LOOK: Prince of Thai with tattoo and Wearing sleeveless,Caught The attention of Netizens! The Photo of a Prince of Thailand appeared with tattoo and a sleeveless top, makes round on Social Media. Netizens says that he should dress well like a respected prince when visiting to other Countries. 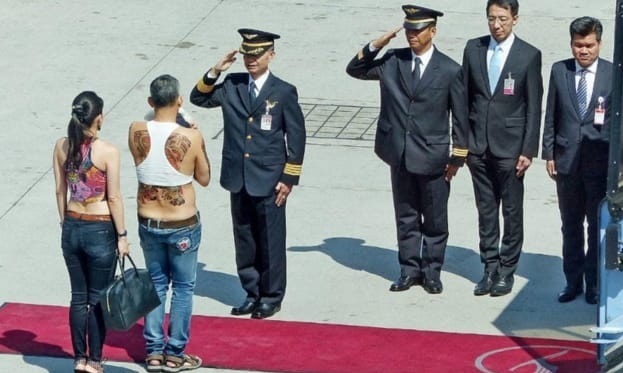 The Prince name, Maha Vajiralongkorn, flew to Munich for Boening-737, and showed up at the airport with a white poodle in his arms, in sandals and a sleeveless ‘top’ put on display a huge tattoo in his back. Apparently, the crown Prince does not enjoy the respect of the citizens of the Kingdom, in contrast to the ruling king Bhumibol Adulyadej (Rama IX). Despite his underdressed look, the crew of Royal Thai Airways still bowed to the couple and paid their respects. One bodyguard opened the door for them as well. “He would need to pull up jeans. If he appears on the streets of Munich, it will be for the homeless or a drug addict, not a Prince,” said one of the users of Facebook. “Looks like he was molested,” said one Internet user.